ACE Comic Con is a brand new comic convention is coming our way very soon, and it’s bringing some huge Marvel names along for the ride! 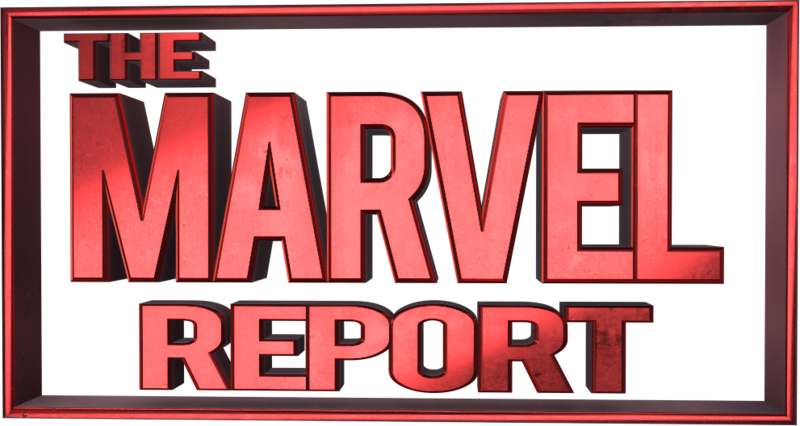 A few weeks ago, the convention announced a show in Long Island, NY with nearly the entire Justice League cast and followed it up last week with a Marvel-focused convention in Glendale (Phoenix) Arizona. In addition to these Captain America / Spider-Man Homecoming actors, Andy Park (Visual Development Supervisor at Marvel Studios) will also be in attendance. Park is a favorite of ours, along with the rest of the Marvel Studios visual development team (hopefully you made it to our Marvel Studios Concept Art Panel last year at Stan Lee’s Los Angeles Comic Con). Tickets went on sale this morning but if you go to the ACE Comic Con website you’ll find much more than just tickets – autographs, photo ops and VIP packages are also available. While Atwell and Stan have made several appearances at conventions and events in the last few years, it’s pretty rare that fans get a chance to meet Chris Evans, Anthony Mackie and especially Tom Holland. ACE Comic Con is also taking a new approach to comic conventions, appearing in arenas, not at convention centers. The Long Island convention (December 8-10) will be at the Nassau Veterans Memorial Coliseum while the Glendale convention (January 13-15) will be at the Gila River Arena – the home of Coyotes hockey. The Glendale convention is also a Saturday/Sunday/Monday convention, with Monday being Martin Luther King Jr. day. ACE Comic Con is also coming at a great time of year – the weather in January will be much more forgiving than the 110+ degree heat often encountered during Phoenix Comic Con in June. Cosplayers rejoice, you aren’t going to melt at this convention! I will be there in my Captain America cosplay, I’m still trying to decide which photo ops to buy. The Tom Holland solo ops have sadly already sold out (fingers crossed that more are added soon), so don’t wait very long! Looking for accommodations? The Hampton Inn / Suites Westgate is the official convention hotel and is right across the street from the Gila River Arena. The Convention Rate was better than anything I could find at any of the closer hotels, and you won’t have to pay for parking. Will we see you there? What photo ops or autographs are you getting? 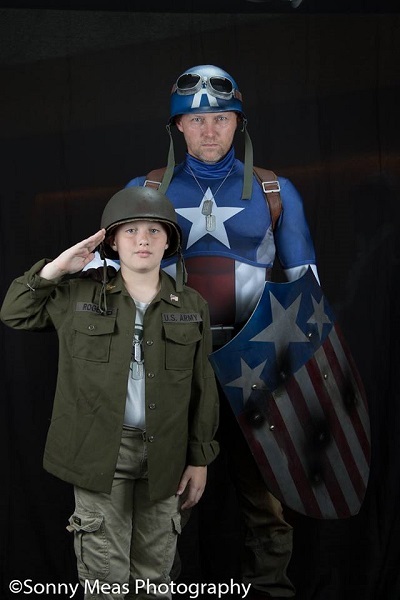 Is this your first time getting a photo op with a big Marvel star? Check out my earlier article about Photo Op Etiquette at Conventions. Also stay tuned for a Marvel Cosplay Meetup that we are planning on coordinating! 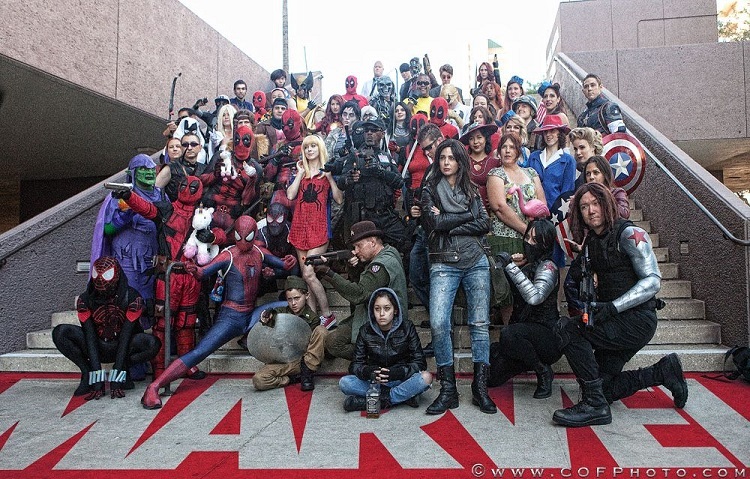 (Photo from The Marvel Report Cosplay Meetup at Long Beach Comic Con). These two guys are really looking forward to it! I hope to see you there.